At times the data in the ERP does not have the correct location relationships established. In such a situation, you can create the relationships in DemandCaster. You may use the "Select Locations" drop down (or any applicable filter) to select the destination via a filter if the source for the destination is consistent across most items. If there are a few that dont follow the path, you may exclude them from the selection or change them one at a time after the initial change is made. Check the items to be updated (or select all if a filter is applied). Select "User Defined" to enable a user defined source location. From the drop down, select the source location to be assigned. 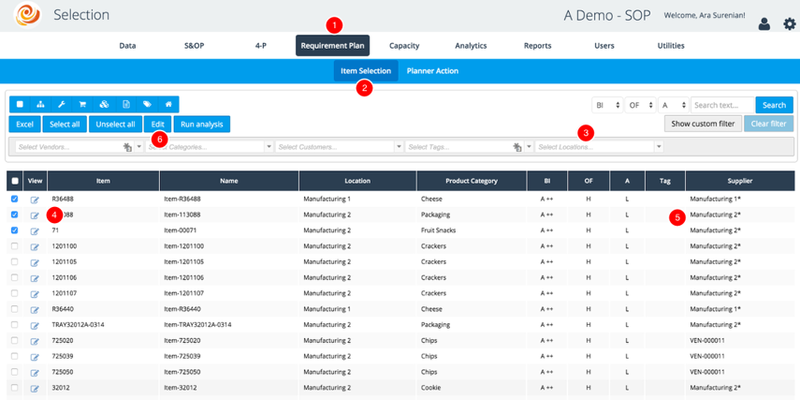 In the example below, we are assigning the location "Manufacturing"
If the Source and Destination locations are the same, then the item is manufactured in the location. Its suggested order will be a Production order. Please be sure the Make / Buy setting for the item / location is set to Make in order to explode a BOM at the location. If the Source and Destination locations are different, then the item will be receiving its inventory at the destination via a transfer from the source. Its suggested order will be a Transfer order. If the Source is a supplier, the item location receives its supply from an outside supplier. Its suggested order will be a Purchase order.